This article is about a monastic order of the Catholic Church. For similar monastic orders of the Eastern Orthodox Church, see Order of Saint Benedict (Orthodox). For similar monastic orders of the Anglican Communion, see Order of St. Benedict (Anglican). For other uses, see Benedictine (disambiguation). The Benedictines, officially the Order of Saint Benedict (Latin: Ordo Sancti Benedicti, abbreviated as OSB), are a monastic Catholic religious order of monks and nuns that follow the Rule of Saint Benedict. They are also sometimes called the Black Monks, in reference to the colour of the members' religious habits. Despite being called an order, the Benedictines do not operate under a single hierarchy but are instead organised as a collection of independent monastic communities, with each community (monastery, priory or abbey) within the order maintaining its own autonomy. Unlike other religious orders, the Benedictines do not have a superior general or motherhouse with universal jurisdiction. Instead, the order is represented internationally by the Benedictine Confederation, an organisation that was set up in 1893 to represent the order's shared interests. ✪ Benedictine Spirituality, Spiritual Values of a Benedictine Oblate - by Maxwell Johnson, Ph.D.
✪ What is a Benedictine monk? 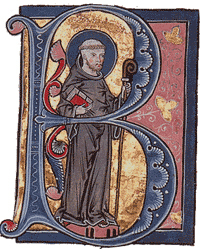 Saint Benedict of Nursia (c. 480–543). Detail from a fresco by Fra Angelico (c. 1400–1455) in the Friary of San Marco Florence. The monastery at Subiaco in Italy, established by Saint Benedict of Nursia c. 529, was the first of the dozen monasteries he founded. He later founded the Abbey of Monte Cassino. There is no evidence, however, that he intended to found an order and the Rule of Saint Benedict presupposes the autonomy of each community. When Monte Cassino was sacked by the Lombards about the year 580, the monks fled to Rome, and it seems probable that this constituted an important factor in the diffusion of a knowledge of Benedictine monasticism. It was from the monastery of St. Andrew in Rome that Augustine, the prior, and his forty companions set forth in 595 on their mission for the evangelization of England. At various stopping places during the journey, the monks left behind them traditions concerning their rule and form of life, and probably also some copies of the Rule. Lérins Abbey, for instance, founded by Honoratus in 375, probably received its first knowledge of the Benedictine Rule from the visit of St. Augustine and his companions in 596. Gregory of Tours says that at Ainay Abbey, in the sixth century, the monks "followed the rules of Basil, Cassian, Caesarius, and other fathers, taking and using whatever seemed proper to the conditions of time and place", and doubtless the same liberty was taken with the Benedictine Rule when it reached them. In Gaul and Switzerland, it supplemented the much stricter Irish or Celtic Rule introduced by Columbanus and others. In many monasteries it eventually entirely displaced the earlier codes. By the ninth century, however, the Benedictine had become the standard form of monastic life throughout the whole of Western Europe, excepting Scotland, Wales, and Ireland, where the Celtic observance still prevailed for another century or two. Largely through the work of Benedict of Aniane, it became the rule of choice for monasteries throughout the Carolingian empire. In the Middle Ages monasteries were often founded by the nobility. Cluny Abbey was founded by William I, Duke of Aquitaine in 910. The abbey was noted for its strict adherence to the Rule of St. Benedict. The abbot of Cluny was the superior of all the daughter houses, through appointed priors. The English Benedictine Congregation is the oldest of the nineteen Benedictine congregations. Augustine of Canterbury and his monks established the first English Benedictine monastery at Canterbury soon after their arrival in 597. Other foundations quickly followed. Through the influence of Wilfrid, Benedict Biscop, and Dunstan, the Benedictine Rule spread with extraordinary rapidity, and in the North it was adopted in most of the monasteries that had been founded by the Celtic missionaries from Iona. Many of the episcopal sees of England were founded and governed by the Benedictines, and no fewer than nine of the old cathedrals were served by the black monks of the priories attached to them. Monasteries served as hospitals and places of refuge for the weak and homeless. The monks studied the healing properties of plants and minerals to alleviate the sufferings of the sick. In the English Reformation, all monasteries were dissolved and their lands confiscated by the Crown, forcing their Catholic members to flee into exile on the Continent. During the 19th century they were able to return to England, including to Selby Abbey in Yorkshire, one of the few great monastic churches to survive the Dissolution. St. Mildred's Priory, on the Isle of Thanet, Kent, was built in 1027 on the site of an abbey founded in 670 by the daughter of the first Christian King of Kent. Currently the priory is home to a community of Benedictine nuns. Five of the most notable English abbeys are the Basilica of St Gregory the Great at Downside, commonly known as Downside Abbey, The Abbey of St Edmund, King and Martyr commonly known as Douai Abbey in Upper Woolhampton, Reading, Berkshire, Ealing Abbey in Ealing, West London, and Worth Abbey. Prinknash Abbey, used by Henry VIII as a hunting lodge, was officially returned to the Benedictines four hundred years later, in 1928. During the next few years, so-called Prinknash Park was used as a home until it was returned to the order. St. Lawrence's Abbey in Ampleforth, Yorkshire was founded in 1802. In 1955, Ampleforth set up a daughter house, a priory at St. Louis, Missouri which became independent in 1973 and became Saint Louis Abbey in its own right in 1989. Since the Oxford Movement, there has also been a modest flourishing of Benedictine monasticism in the Anglican Church and Protestant Churches. Anglican Benedictine Abbots are invited guests of the Benedictine Abbot Primate in Rome at Abbatial gatherings at Sant'Anselmo. There are an estimated 2,400 celibate Anglican Religious (1,080 men and 1,320 women) in the Anglican Communion as a whole, some of whom have adopted the Rule of St. Benedict. The first record of a monastic library in England is in Canterbury. To assist with Augustine of Canterbury's English mission, Pope Gregory the Great gave him nine books which included the Gregorian Bible in two volumes, the Psalter of Augustine, two copies of the Gospels, two martyrologies, an Exposition of the Gospels and Epistles, and a Psalter. Theodore of Tarsus brought Greek books to Canterbury more than seventy years later, when he founded a school for the study of Greek. Monasteries were among the institutions of the Catholic Church swept away during the French Revolution. Monasteries were again allowed to form in the 19th century under the Bourbon Restoration. Later that century, under the Third French Republic, laws were enacted preventing religious teaching. The original intent was to allow secular schools. Thus in 1880 and 1882, Benedictine teaching monks were effectively exiled; this was not completed until 1901. Saint Blaise Abbey in the Black Forest of Baden-Württemberg is believed to have been founded around the latter part of the tenth century. Other houses either reformed by, or founded as priories of, St Blasien were: Muri Abbey (1082), Ochsenhausen Abbey (1093), Göttweig Abbey (1094), Stein am Rhein Abbey (before 1123) and Prüm Abbey (1132). It also had significant influence on the abbeys of Alpirsbach (1099), Ettenheimmünster (1124) and Sulzburg (ca 1125), and the priories of Weitenau (ca 1100), Bürgeln (before 1130) and Sitzenkirch (ca 1130). The abbey of Our Lady of the Angels was founded in 1120. The first Benedictine to live in the United States was Pierre-Joseph Didier. He came to the United States in 1790 from Paris and served in the Ohio and St. Louis areas until his death. The first actual Benedictine monastery founded was Saint Vincent Archabbey, located in Latrobe, Pennsylvania. It was founded in 1832 by Bonifice Wimmer, a German monk, who sought to serve German immigrants in America. In 1856, Wimmer started to lay the foundations for St. John's Abbey in Minnesota. In 1876, Father Herman Wolfe, of Saint Vincent Archabbey established Belmont Abbey in North Carolina. By the time of his death in 1887, Wimmer had sent Benedictine monks to Kansas, New Jersey, North Carolina, Georgia, Florida, Alabama, Illinois, and Colorado. Wimmer also asked for Benedictine sisters to be sent to America by St. Walburg Convent in Eichstätt, Bavaria. In 1852, Sister Benedicta Riepp and two other sisters founded St. Marys, Pennsylvania. Soon they would send sisters to Michigan, New Jersey, and Minnesota. By 1854, Swiss monks began to arrive and founded St. Meinrad Abbey in Indiana, and they soon spread to Arkansas and Louisiana. They were soon followed by Swiss sisters. Benedictine monks singing Vespers on Holy Saturday in Morristown, New Jersey, U.S. The sense of community was a defining characteristic of the order since the beginning. Section 17 in chapter 58 of the Rule of Saint Benedict states the solemn promise candidates for reception into a Benedictine community are required to make: a promise of stability (i.e. to remain in the same community), conversatio morum (an idiomatic Latin phrase suggesting "conversion of manners"; see below) and obedience to the community's superior. This solemn commitment tends to be referred to as the "Benedictine vow" and is the Benedictine antecedent and equivalent of the evangelical counsels professed by candidates for reception into a religious order. In the Roman Catholic Church, according to the norms of the 1983 Code of Canon Law, a Benedictine abbey is a "religious institute" and its members are therefore members of the consecrated life. While Canon Law 588 §1 explains that Benedictine monks are "neither clerical nor lay", they can, however, be ordained. In modern times, the various groups of autonomous houses (national, reform, etc.) have formed themselves loosely into congregations (for example, Cassinese, English, Solesmes, Subiaco, Camaldolese, Sylvestrines). There are twenty Congregations within the Benedictine Confederation. These, in turn, are represented in the Benedictine Confederation that came into existence through Pope Leo XIII's Apostolic Brief "Summum semper" on 12 July 1893. This organization facilitates dialogue of Benedictine communities with each other and the relationship between Benedictine communities and other religious orders and the church at large. The Abbot Primate resides at the Monastery of Sant’ Anselmo in Rome. In 1313 Bernardo Tolomei established the Order of Our Lady of Mount Olivet. The community adopted the Rule of St. Benedict and received canonical approval in 1344. The Olivetans are part of the Benedictine Confederation. The Rule of Saint Benedict is also used by a number of religious orders that began as reforms of the Benedictine tradition such as the Cistercians and Trappists. These groups are separate congregations and not members of the Benedictine Confederation. One or more of the preceding sentences incorporates text from a publication now in the public domain: Alston, Cyprian (1907). "The Benedictine Order" . In Herbermann, Charles. Catholic Encyclopedia. 2. New York: Robert Appleton. ^ a b c "The Benedictines: An Introduction by Abbot Primate Jerome Theisen OSB. Liturgical Press". ^ "Dom Bruno Hicks OSB. The Benedictines (frames)". Archived from the original on 5 November 2017. Retrieved 15 February 2015. ^ Colin Battell, OSB, "Spirituality on the beach," The Tablet 2 December 2006, 18-19. The late Cardinal Basil Hume was Abbot of Ampleforth Abbey before being appointed Archbishop of Westminster. ^ "History - The English Benedictine Congregation". benedictines.org.uk. Archived from the original on 11 February 2015. Retrieved 11 February 2015. ^ Kaur, Nirmal (2005). History of Education. Mittal Publications. p. 44. ISBN 81-7099-984-7. Retrieved 1 April 2015. ^ "Historique I". st-benoit-du-lac.com. Retrieved 29 November 2008. ^ "A History of the Popes, 1830-1914". Retrieved 29 November 2008. ^ Wootton and Fishbourne. Ryde.shalfleet.net (4 August 2013). Retrieved on 7 September 2013. ^ RGM 2005 OCSO. Citeaux.net (28 February 1947). Retrieved on 7 September 2013. ^ ""History of Belmont Abbey", Belmont Abbey, North Carolina". Archived from the original on 16 April 2018. Retrieved 4 November 2017. ^ "The Benedictine Congregations and Federations of North America in the Benedictine Confederation". www.osb.org. Archived from the original on 3 September 2017. Retrieved 24 November 2015. ^ "The Benedictine Confederation". OSB.org. Retrieved 24 October 2018. Dom Columba Marmion OSB, Christ the Ideal of the Monk – Spiritual Conferences on the Monastic and Religious Life (Engl. edition London 1926, trsl. from the French by a nun of Tyburn Convent). Wikimedia Commons has media related to Order of Saint Benedict. "Abbey: Benedictine" . Encyclopædia Britannica. 1 (11th ed.). 1911. pp. 12–14.